Ten years later Camille left Rodin, and set herself up in her own studio. Rodin tried to send commissions her way, and for several years she was able to work productively. After successful exhibitions in the Galerie Eugène Blot in 1905 and 1908, however, Camille became withdrawn and unable to work. She became convinced that Rodin and his “gang” were trying to steal her ideas. She destroyed many of her maquettes. She boarded up her studio and lived in dirt and squalor, coming out only at night. In 1913, her family had her forcibly committed to an insane asylum near Paris. With the onset of the war, Camille was transferred to the Montdevergues asylum in Provence. There she remained until her death in 1943 at the age of 79. The affair between Rodin and Camille was well known to their colleagues. However, it was hidden from society, and little documentation survives to describe their passion. Novelists (Delbée, 1982/1992; Webb, 2015), musicians (Heggie & Scheer, 2012) and actors (Anne Delbée, 1982; Isabelle Adjani in Nuytten, 1988/2011; Juliette Binoche in Dumont, 2013) have imagined what it was like to be Camille, but we remain unsure. Camille’s position in the affair was by far the more precarious. Rodin already had a mistress – Rose Beuret, a former model. She tolerated Rodin’s affairs but maintained the right of primacy. Rose was indeed considered by many to be Rodin’s wife, although they were not formally married until 1917 (just before both Rodin and she were to die). I will have for a student only Mademoiselle Camille Claudel and I will protect her alone though all the means I have at my disposal through my friends who will be hers especially through my influential friends (Ayre-Clause, 2002, p.71). Have pity, cruel girl, I can’t go on, I can’t spend another day without seeing you. Otherwise the atrocious madness. It is over, I don’t work anymore, malevolent goddess, and yet I love furiously. My Camille be assured that I feel love for no other woman, and that my soul belongs to you. … Ah! Divine beauty, flower who speaks and loves, intelligent flower, my darling. My dear one, I am on my knees facing your beautiful body which I embrace. Their physical passion was allied to creative cooperation. Similar themes occur in the work of both artists. 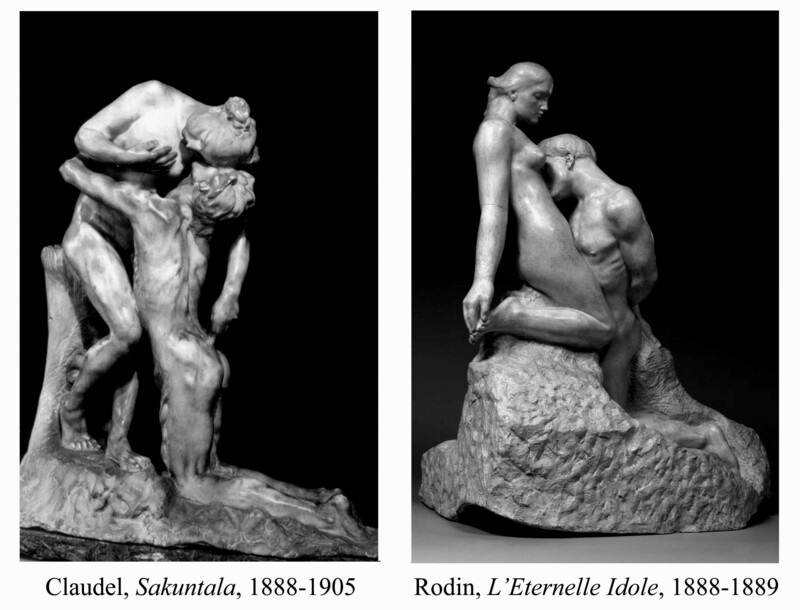 Perhaps the most striking parallel is found between Camille’s Sakuntala and Rodin’s Eternal Idol. Camille’s sculpture is based on an Indian legend about a king who married the maiden Sakuntala, but then was cursed and lost the memory of both his wife and his son. Ultimately the curse was lifted, and the sculpture depicts the moment of their reconciliation. A girl kneels, her beautiful body is softly bent backward, her right arm is stretched behind her. Her hand has gropingly found her foot. In these three lines which shut her in from the outer world her life lies enclosed with its secret. The stone beneath her lifts her up as she kneels there. And suddenly, in the attitude into which the young girl has fallen from idleness, or reverie, or solitude, one recognizes an ancient, sacred symbol, a posture like that into which the goddess of distant, cruel cults had sunk. The head of this woman bends somewhat forward; with an expression of indulgence, majesty and forbearance, she looks down as from the height of a still night upon the man who sinks his face into her bosom as though into many blossoms. He, too, kneels, but deeper, deep in the stone. His hands lie behind him like worthless and empty things. His right hand is open; one sees into it. From this group radiates a mysterious greatness. One does not dare to give it one meaning, it has thousands. Thoughts glide over it like shadows, new meanings arise like riddles and unfold into clear significance. Something of the mood of a Purgatorio lives within this work. A heaven is near that has not yet been reached, a hell is near that has not yet been forgotten. [Ein Himmel ist nah, aber er ist noch nicht erreicht; eine Hölle ist nah, aber sie ist noch nicht vergessen.] Here, too, all splendour flashes from the contact of the two bodies and from the contact of the woman with herself. (Rilke, 1907/1919, pp 42-43). At the time that she was ending the affair with Rodin, Camille was working on a sculptural ensemble called the L’Age mûr (Maturity). It depicts a man being led away from a pleading young woman by an old woman. The figure of the young woman was also reproduced by itself as L’Implorante (Supplicant). The ensemble can be interpreted as fate leading man away from youth toward death. However, it is impossible not to see the Rose Beuret, Rodin and Camille in the figures. 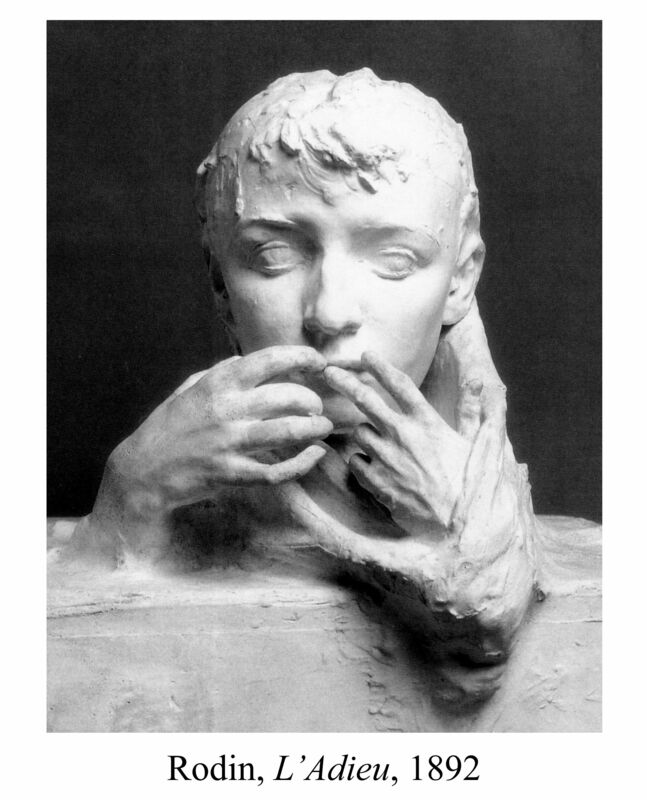 After her break with Rodin, Claudel worked as an independent artist. She had very little money to support large bronze castings and her major sales involved small pieces for tabletop. Camille became adept at creating sculptures for personal rather than public enjoyment. Two pieces are worth noting. 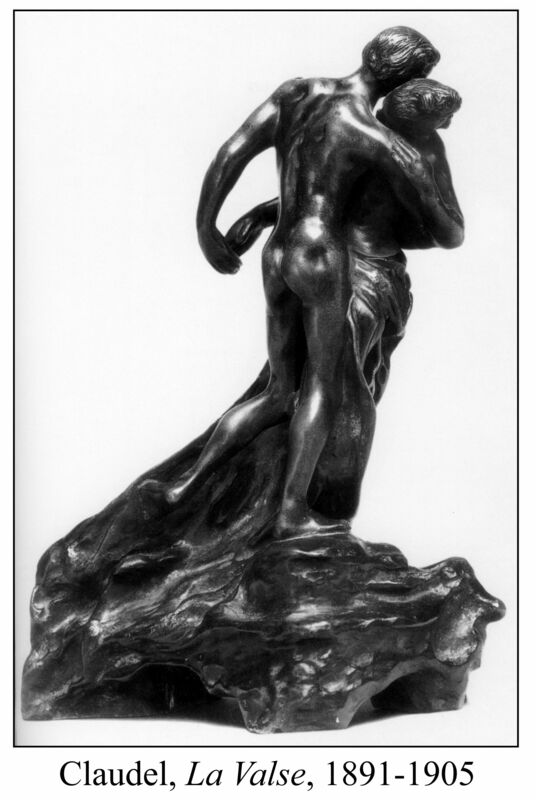 The first is The Waltz, several copies of which were cast in bronze. One graced the piano of Claude Debussy. Its fascination lies in the way it combines both movement and stillness. Is it in the spirit? Is it in the flesh? Oh, console my eyes with beauty. Another piece – Deep Thought – shows a young woman kneeling before a fireplace. The piece combines both bronze and onyx in a marvelous mix of texture. It is difficult to say why this resonates so deeply. Perhaps it suggests the dreams of what might be or what might have been. Just as a man sitting in the countryside employs, to accompany his meditation, a tree or a rock on which to anchor his eye, so a work by Camille Claudel in the middle of a room is, by its mere form, like those curious stones that the Chinese collect: a kind of monument of inner thought, the tuft of a theme accessible to any and every dream. While a book, for example, must be taken from the shelves of our library, or a piece of music must be performed, the worked metal or stone here releases its own incantation, and our chamber is imbued with it. (Claudel , 1913b, translated by Richard Howard in Paris, 1988). For a sculptor, large compositions were essential to recognition and success. The sales of the small pieces did not bring in very much money, and Camille’s stipend from her father was not large. She lapsed into poverty, depression and paranoia. She attributed her lack of success to Rodin, whom she accused of stealing her work and making money by re-casting her sculptures and selling them to “his pals, the chic artists” (letter to Paul Claudel, 1910, quoted in Paris, 1984/1988, p 132). By 1913, Camille’s condition was dire. Dr. Michaux, the physician who certified that she should be committed to an asylum, said that she had sealed up the windows of her studio, had sold everything except for an armchair and a bed, never washed, never went out except by night, and often went without food (Wilson, 2012). Camille’s father died on March 2, 1913. As soon as this last support was gone, the Claudel family quickly moved to have Camille committed. On March 10 Camille was forcibly interned in an asylum near Paris. Her diagnosis was paranoid psychosis. Some of her supporters voiced objections, but these came to naught. When the war began Camille was transferred to the Montdevergues asylum in the south of France, where she remained until she died in 1943. At the asylum, Camille continued to have paranoid thoughts about Rodin. After Rodin died in 1917, Camille transferred her suspicions to his followers (and to various Protestant and Jewish cliques). She insisted on preparing her own food, since she was afraid that her enemies were trying to poison her. Nevertheless, much of the time Camille was quite rational. She was never aggressive or violent. Her doctors continuously recommended that she be taken back to live with the family, or at least transferred to a hospital near the family, where she could be visited more easily. The family refused any such suggestions. For fear of scandal, they insisted that Camille not be allowed to send or receive mail from anyone other than her brother and mother. Paranoia sets up positive feedback loops: when patients perceive that people are acting against them, they actually often are. Paranoid thinking is common. Delusions of persecution occur more frequently than delusions of grandeur. About 10-15% of people harbors thoughts that they are persecuted (Freeman, 2007). Most of these do not require treatment. Modern cognitive psychology considers persecutory delusions to be largely caused by a willingness to “jump to conclusions” when entertaining theories about the origin of stress (Freeman & Garrety, 2014). Additional factors are social isolation, which decreases the chance of anyone providing meaningful feedback, and a lack of sleep, which leads to dream-like rather than rational thought. Paranoia is a continuum. Although many people with mild delusions can function normally, more ingrained delusions can lead to problems adjusting to society. In the past, mild forms of paranoia were considered paranoid personality disorder, and more severe forms paranoid psychosis, although these specific diagnostic categories are no longer recognized. The psychiatrists Lhermitte and Allilaire (1984) reviewed the psychiatric history of Camille Claudel and came to a diagnosis of paranoid psychosis. With her arms folded around herself, Camille does not seem to see Jessie’s hand softly reaching out to her. The long years of isolation have taken their toll; Camille looks empty and withdrawn. Social isolation is probably the worst approach to treating paranoia. Somehow, the patients must be induced to interact with others. They must learn to consider themselves as others see them. Clearly this must be commenced gently with a therapist whom the patient trusts. The treatment must try to decrease the ingrained suspicion of others, and to help the patient to use more rational modes of thought. Je suis tombée dans le gouffre. Je vis dans un monde si curieux, si étrange. Du rêve que fut ma vie, ceci est le cauchemar. I have fallen into the abyss. I live in a world so curious, so strange. Of the dream that was my life, this is the nightmare. (quoted by Morel, 2009). The position of Claudel family toward Camille is difficult to understand (Lhermitte & Allilaire, 1984; Schmoll gen. Eisenwerth, 1994, pp 109-114; Ayre-Clausse, 2002, pp 237-253). Camille’s mother was so scandalized by her daughter’s behavior and so constrained by her rigid religion that she never once visited her in hospital. Louise also could not bring herself to have anything to do with her wayward sister. Some of this rejection reflected the way mental disorders were considered at the time (Lhermitte & Allilaire, 1984): mad relatives were hidden away from society and ignored. Paul Claudel (1868-1955) was Camille’s younger brother. In 1886, at the age of 18, he experienced a mystical revelation while listening to the Magnificat in Notre Dame, and thenceforth was a devoted Catholic. He became a renowned poet (e.g., Claudel, 1913a) and playwright (e.g., Claudel, 1960). His poetry is impressive: he used a new form of blank verse with the length of the line related to the time it takes to speak the line before taking a breath. His poetry has the sound of litany and incantation. At times, however, the writing becomes tedious, so closely is it related to his religious beliefs. Paul became a professional diplomat, representing France in the United States, China, Brazil, Denmark and Tokyo. Despite his devoutness, he carried on a long adulterous affair with a married woman, until she finally broke of their relationship. Paul was Camille’s favorite sibling. One of her first major sculptures was a bust of Paul as a young Roman. 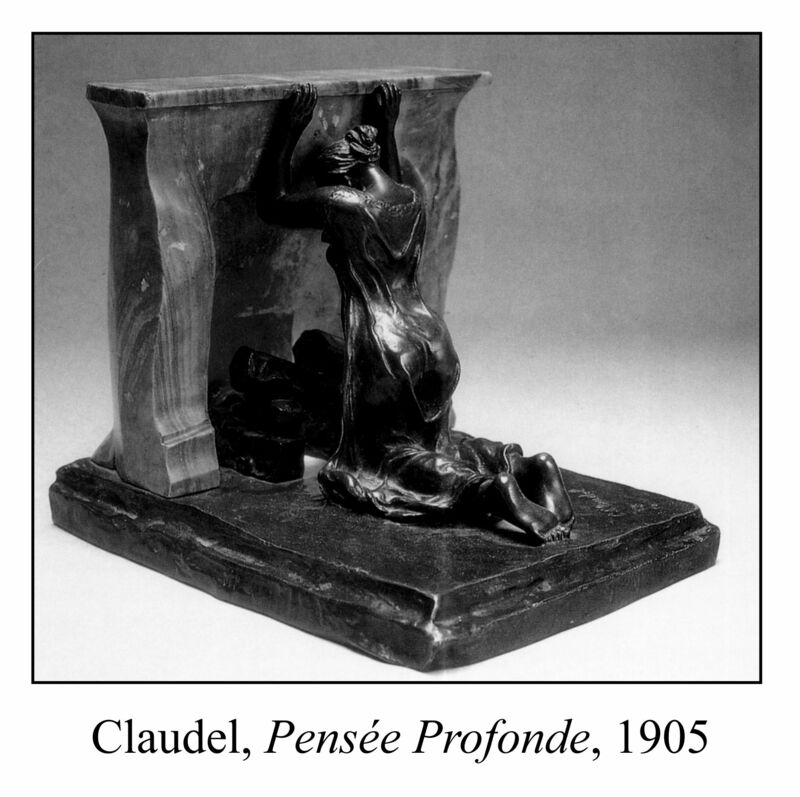 Paul promoted his sister’s career, writing articles in magazines glorifying her sculptures (e.g., Claudel, 1913b). Despite their closeness as children and despite his enthusiasm for her art, Paul had little to do with Camille after she was admitted to Montdevergues. He visited her only a few times, and refused all of her requests to be released or transferred closer to the family. Some of this may have been related to his diplomatic appointments, but he did not visit even when he retired and he settled down in France in 1936. This lack of compassion is strange in a man so religious. Sometimes the mystic forgets himself in his visions and forgets to care for others. 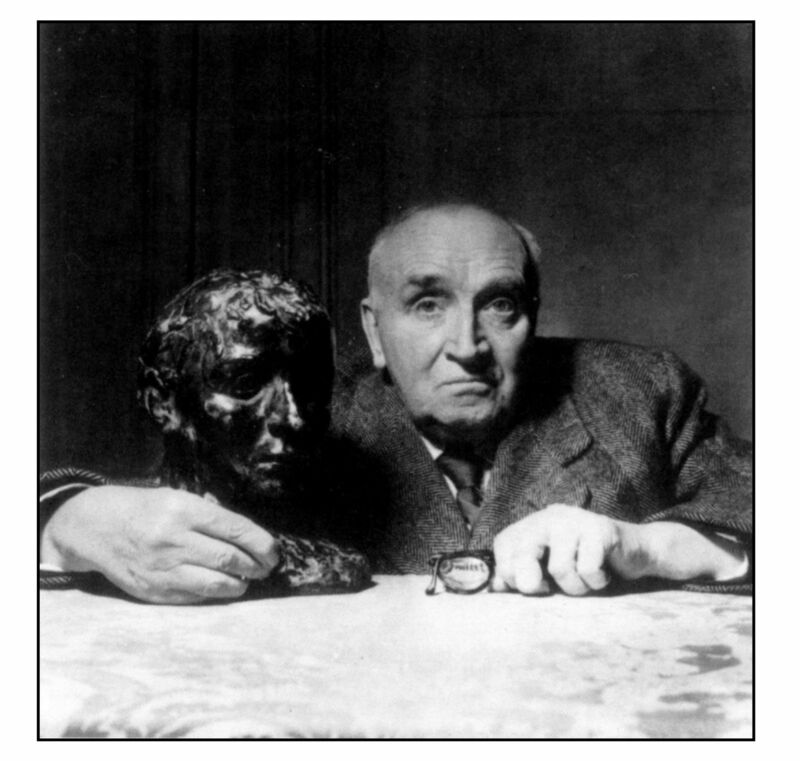 In a photograph taken in 1951, the elderly Paul Claudel holds onto a bust Camille made of him when he was young. The photograph is imbued with regret. Yet it is not clear whether it is for himself or his sister. We should not leave Camille without seeing her as she was in her time of passion and creation. One of the most insightful impressions of Camille is a plaster cast by Rodin, a portrait of Camille, aptly entitled The Farewell. Both the hands and the face are exquisitely moulded. The sculpture is ambiguous. Are the hands reaching up to stop the tears, to shut out the world, or to gather something in? Claudel, C. (2008). 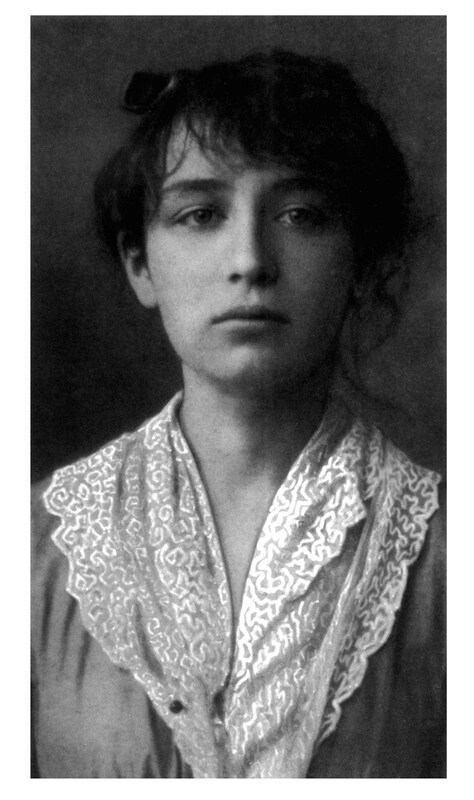 Camille Claudel: 1864-1943. Paris: Musée Rodin (Gallimard). Claudel, P. (1913a). Cinq grandes odes: Suivies d’un processionnal pour saluer le siècle nouveau. Paris: Gallimard. Claudel, P. (1913b). Camille Claudel: statuaire. L’Art Décoratif. Revue de l’art ancient et de la vie artistique moderne. 30 (July, 1913), 5-50. Claudel, P. (translated by W. Fowlie, 1960). Two dramas: Break of noon (Partage de midi) The tidings brought to Mary (L’annonce faite à Marie). Chicago: H. Regnery. Delbée, A. (1982, translated by Cosman, C., 1992). Camille Claudel: Une femme. San Francisco: Mercury House. Delbée also acted in the play Une Femme from which this novel derives. Dumont. B. (2013). Camille Claudel 1915 (videorecording) Montréal: TVA Films. Freeman, D., & Garety, P. (2014). Advances in understanding and treating persecutory delusions: a review. Social Psychiatry and Psychiatric Epidemiology, 49, 1179–1189. Heggie, J., & Scheer, G. (2012) Camille Claudel: Into the fire. Music for mezzo-soprano and string quartet. San Francisco: Bent Pen Music. Performed by Joyce DiDonato and the Alexander Quartet on the CD: Here/after: Songs of lost voices. Baarn, Netherlands: Pentatone Classics. Morel, J.-P. (2009).Camille Claudel: Une mise au tombeau. Bruxelles: Impressions nouvelles. Nuytten, B. (1988/2001). Camille Claudel. (videorecording). Santa Monica, CA: MGM Home Entertainment. Paris, R.-M. (1984, translated by Tuck, L.E., 1988). Camille: The life of Camille Claudel, Rodin’s muse and mistress. New York: Seaver Books. Rilke, R. M. (1907, translated by J. Lemont & H. Taussig, 1919). Auguste Rodin. New York: Sunrise Turn. Schmoll gen. Eisenwerth, J. A. (1994, translated by J. Ormrod). Auguste Rodin and Camille Claudel. Munich: Prestel-Verlag. Webb, H. (2015). Rodin’s lover. New York: Plume. Wilson, S. (2010). Camille Claudel: ‘Du rêve que fut ma vie, ceci est le cauchemar’ In S. Wilson (Ed. 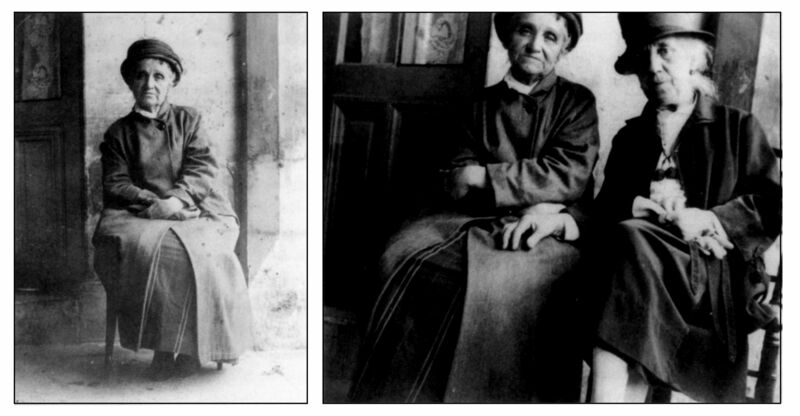 ): Voices from the Asylum: Four French Women Writers, 1850-1920. (pp. 184-221). New York: Oxford.